The Nigerian military has fought off a new attack by Boko Haram militants in the key city of Maiduguri, located in the country's northeast. Seizure of the city could lead to a humanitarian catastrophe just before presidential elections. Witnesses told AFP that the insurgents began shooting at 3:00 a.m. local time (2 a.m. GMT) on Sunday in the southern suburbs of Maiduguri, the capital of Borno state, but were confronted by government troops and local vigilantes. At least eight people died in the attack, witnesses and a hospital source told Reuters. "The whole city is in fear," local resident Adam Krenuwa told AFP. "People are afraid of what will happen if Boko Haram defeats the security forces." The militants reportedly attacked three points in the southwest and southeast simultaneously, a security source told Reuters. Several hours into the battle, the fighting reportedly focused on the Mulai area, located three kilometers (two miles) south of the city. According to authorities, the government troops managed to contain the militants quite quickly. “The terrorists’ attack on Maiduguri in the early hours of Sunday was quickly contained. The terrorists incurred massive casualty,” said Defense Ministry spokesman Chris Olukolade. The previous Boko Haram attack on January 25 was stopped by government troops. About 100 people were killed. The loss of the city – where the insurgency sprang from about five years ago – is a serious problem for the army and government, which are facing severe criticism for their inability to stop the militants. The official population of Maiduguri is about one million, but it is reported that hundreds of thousands of refugees came there from rural areas which are under Boko Haram's control. The fall of the city would likely cause a humanitarian catastrophe, aid agencies have warned. Nigeria's presidential election is scheduled for February 14, but there are doubts if the refugees will be able to vote, as a significant part of the country is under the control of Boko Haram. Last month, Nigeria's national security advisor, Sambo Dasuki, called for a postponement of the election. The opposition rejected the idea, suspecting it could have been a trick launched by the ruling party. Boko Haram's attacks have caused great concern not only in Nigeria, but also in adjacent countries. The African Union Peace and Security Council has authorized a force of 7,500 troops from Nigeria, Chad, Cameroon, Niger, and Benin to fight the militants, Ghana President John Mahama told journalists on Saturday. UN Secretary General Ban Ki-moon has approved of the plan. "I welcome the decision of the African Union and regional countries to establish an MJTF [Multinational Joint Task Force] against Boko Haram," he said. On Saturday, Chadian authorities reported the country's military killed 120 Boko Haram militants in a battle in the north of Cameroon, after the militants attacked troops. Maiduguri is seen as a strategic goal for Boko Haram, which wants to establish an Islamist caliphate based on Sharia law in northern Nigeria. The militant group controls vast areas that make up a territory approximately the size of Slovakia. 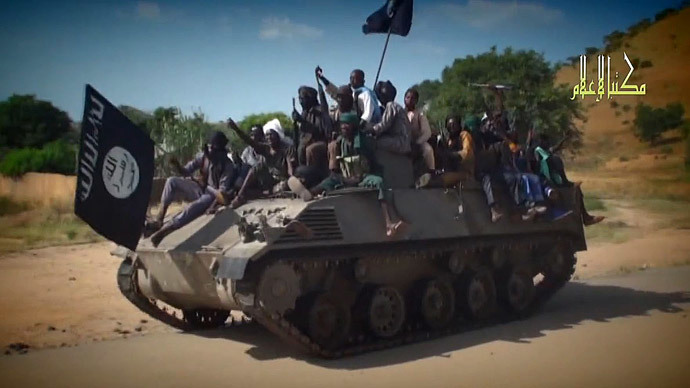 The militants reportedly plan to proclaim Maiduguri their capital after seizure. Nigeria is Africa's biggest economy and top oil producer. Boko Haram atrocities are estimated to have left at least 13,000 dead since the insurgency began in 2009. Around 1.5 million people have become internal refugees due to the violence, soaring from 600,000 in the past six months, according to the UN.